MacKenzie Contracting Company, LLC has been awarded an Excellence in Construction Award by the Associated Builders and Contractors, Inc. (ABC) for their project at Anne Arundel Community College (AACC), Anne Arundel County, Maryland. Receiving ABC’s highest award, Excellence, the project was a complete renovation of the 25,000 square foot Humanities Building, situated on campus at 101 College Parkway, Arnold, Maryland. The annual Excellence in Construction Awards honors the Nation’s most innovative and high quality construction projects and outstanding contractors, recognizing their achievements in leadership, safety, innovation, and diversity. MacKenzie’s Senior Vice President of Operations Scott Albright and Superintendent Bill Edwards oversaw the project, completing all required work on time and while classes were in session. 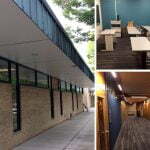 The renovation included complete upgrade of the HVAC system, asbestos removal, replacing all exterior doors and windows, reworking all sprinkler lines, replacement of ceilings with new acoustical ceiling grid and tile, new lighting and flooring, painting, corridor space upgrades, and additional exterior paint and repairs. The work was completed in seven phases to allow for the flow of students and faculty to continue uninterrupted. For more information on this project, please contact Joe Versey at 443-610-7505 or jversey@mackenziecontracting.com. For information on the offerings of MacKenzie Contracting Company, LLC, please visit www.mackenziecommercial.com. MacKenzie Ventures, LLC (MacKenzie) possesses the multi-disciplined team necessary to excel in Maryland’s corporate real estate community. Comprising seven firms, MacKenzie provides clients a competitive, full service platform of offerings in leasing, sales, investment sales, tenant and landlord advisory services, corporate and business consulting, commercial and residential development, general construction, property and asset management, debt and equity capital placement, and market research. With more than 150 employees and offices in Annapolis, Baltimore, Bel Air, Columbia, and Lutherville, Maryland, MacKenzie is one of the largest full service commercial real estate firms in the Mid-Atlantic. Please visit www.mackenziecontracting.com for more information.